Farewell for now, Officer Ozzie. 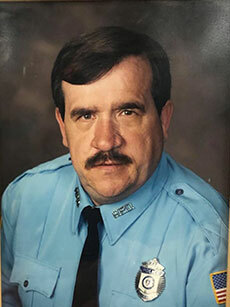 Osmond “Ozzie” Hardy’s family—including his brothers and sisters in blue from Haverhill, the Massachusetts State Police and beyond—laid the late first responder to rest Monday on what would have been his 69th birthday. Mourners packed All Saints Church for a Funeral Mass of Christian Burial presided over by Father Timothy Kearney at the personal request of the Hardy family. Music from bagpipers was heard as Hardy’s flag-draped casket was carried into the church by pallbearers, including Hardy’s close friend and former coworker, Haverhill Police Detective John Moses. Haverhill Pastor Paul Soucy shared a bit from one of his final conversations with Hardy, while Kearney offered a touching apology of sorts to Hardy’s widow, Gayle, for taking her husband away from the family on so many Christmases as he distributed toys to Haverhill’s children in need through Ozzie’s Kids. “Sorrow has the ability to make us well-rounded people. Pain can be a powerful teacher. Ozzie is teaching us something here today,” Soucy said. Hardy was buried at Haverhill’s St. Joseph’s cemetery on Hilldale Avenue with full police and military honors. He died Wednesday, April 10. To support Hardy’s Ozzie’s Kids foundation, donations may be made in his memory to Ozzie’s Kids, c/o N.E. Exchange, 44 Merrimack St., #213, Haverhill, MA 01832.